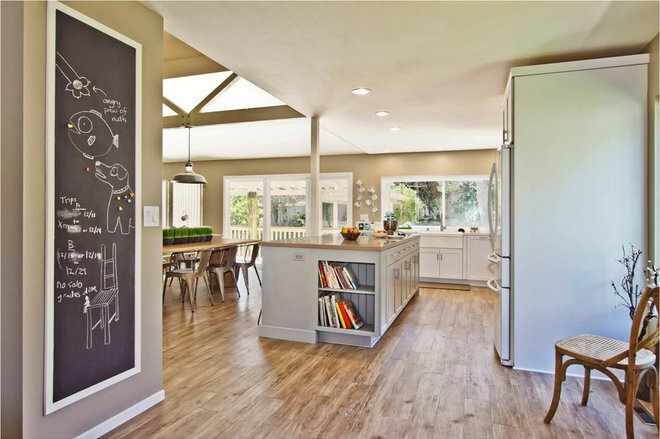 Not all kitchen floors are created equal. As much as we’d like every floor to have exceptional durability, a low price tag, superior longevity and sky-high resale value, it just isn’t realistic. 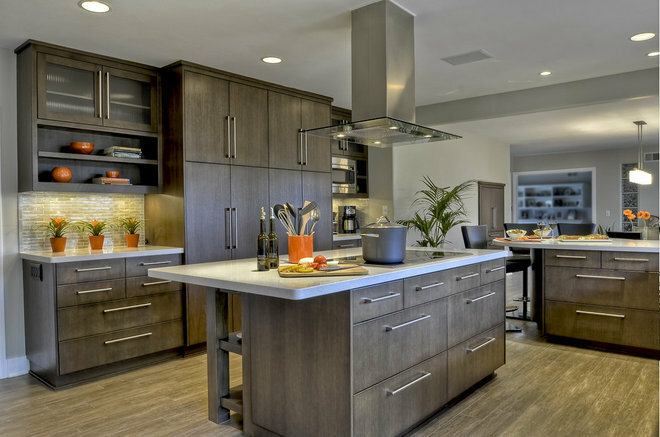 If you’re planning to revamp your kitchen floors, knowing the strengths and weaknesses of hardwood, tile, travertine, laminate and vinyl is paramount. We weigh the pros and cons of these five common flooring types to help you select the right option for your lifestyle. The appeal of a rich cherry or smooth maple never fades. There’s also much to love about hickory, mesquite, oak and walnut. When it comes to flooring, they’re often at the top of the pecking order. Buyers can choose between solid hardwood or engineered hardwood, which is constructed with several layers of wood called plies. Pros: Just about everyone wants hardwood floors, including home buyers. The resale value is through the roof. Other flooring products can come close but never fully replicate their natural beauty. Hardwood floors have the ability to be refinished and can last for centuries too. 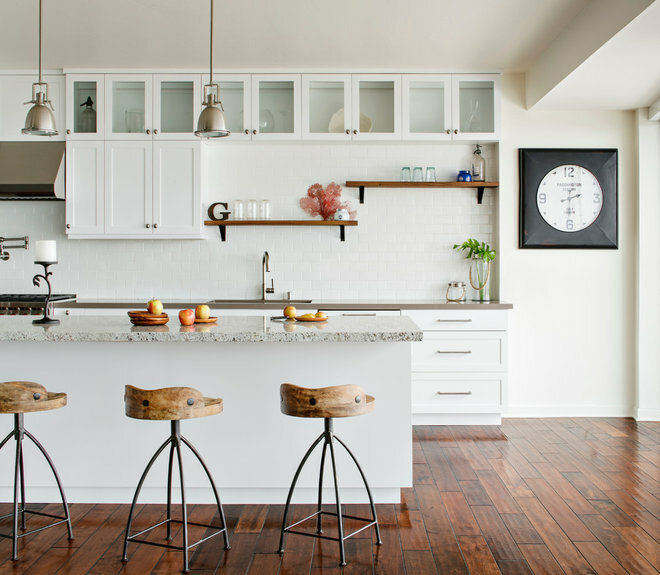 Cons: Hardwood floors aren’t always practical for homeowners who want low-maintenance kitchens. They scratch more easily than other materials and are harder to clean. When exposed to moisture over the long term, they can warp, buckle or crown. And then there’s the price tag. Since quality hardwood floors run from $4 to $12 per square foot, expect to tap into your bank account. 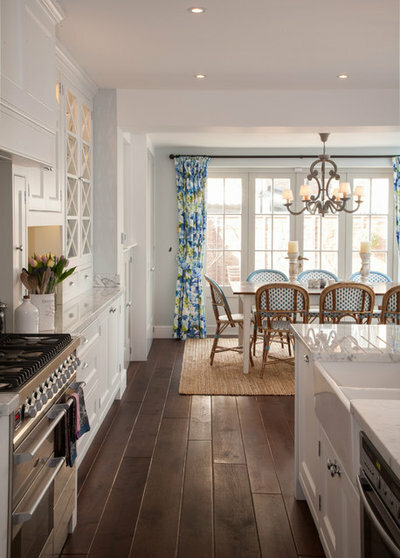 Mix the sizes of your hardwood planks to add dimension to your kitchen. 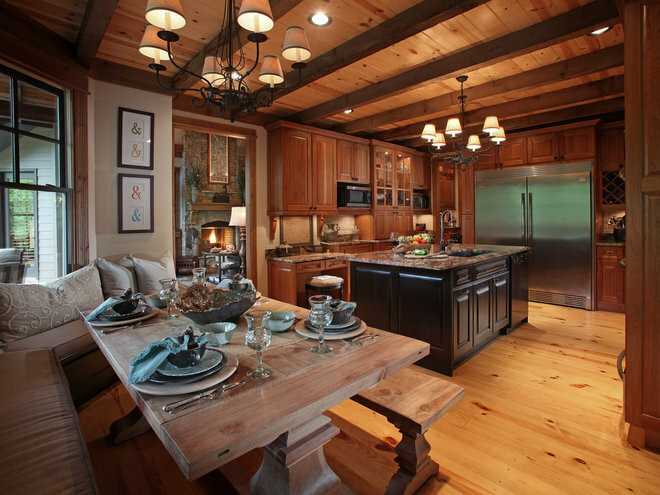 This traditional kitchen has planks with varied widths, but you can also choose planks with different lengths. Cleaner hardwood styles can blend in well with modern and contemporary designs. 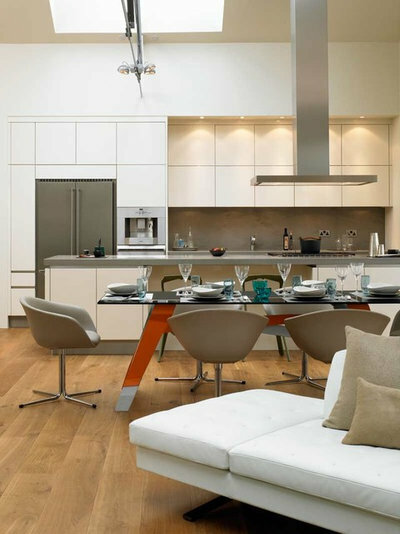 Hardwood flooring with a raw, unfinished texture gives this sleek London cooking space a natural midcentury modern touch. 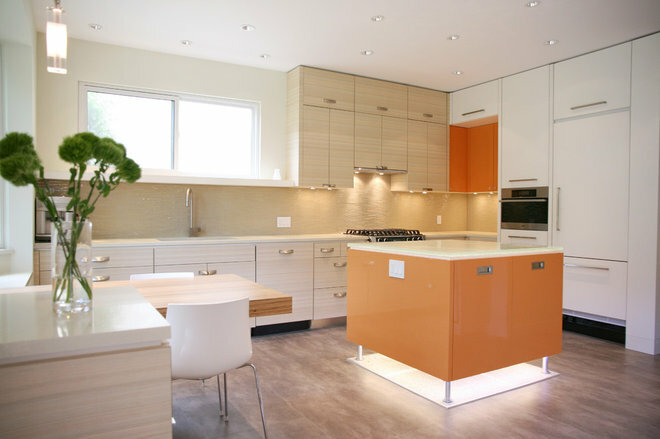 Hardwood floors can also sport contemporary color palettes. This Miami kitchen uses gray oak to ground the ethereal white cabinetry. Woods with knots, grains and hand-scraped textures have strong character. They can restore a home’s original charm when you’re renovating a fixer-upper. Much can be said about the options that tile affords homeowners. Modern printing technology can generate ceramic and porcelain tile surfaces that mimic natural stone (travertine and marble), wood and concrete, plus clean monotone styles. This versatility almost guarantees you’ll find a style you like. Pros: Moisture is no match for porcelain, which absorbs less water than ceramic. Tile has a hard surface that is uber-durable, especially color body porcelain (where the color runs through the tile instead of being just on the surface). It won’t scratch easily and should last for however long you decide to live in your home. It’s perhaps the easiest floor to clean. It can withstand most detergents, though all you really need is water and a mop. Tile is also well-priced; it’s possible to find a quality porcelain for $4 a square foot or less. Cons: Tile with a smooth finish can get slick when wet. And despite how durable it is, it can still crack and chip if a heavy object hits its surface. Though standard tile is affordable, plank tile and marble tile can cost nearly as much as wood and stone. Older homeowners and those with foot or knee problems may have difficulty standing on its rock-hard surface. 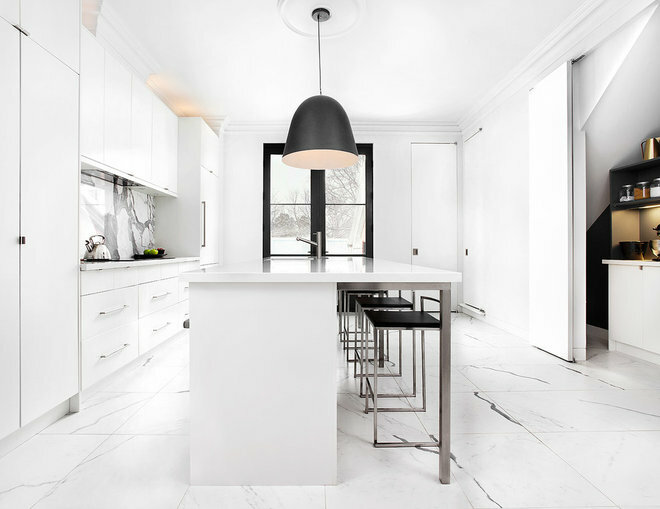 The porcelain tile in this minimalist kitchen captures the natural movement of marble sans the maintenance. 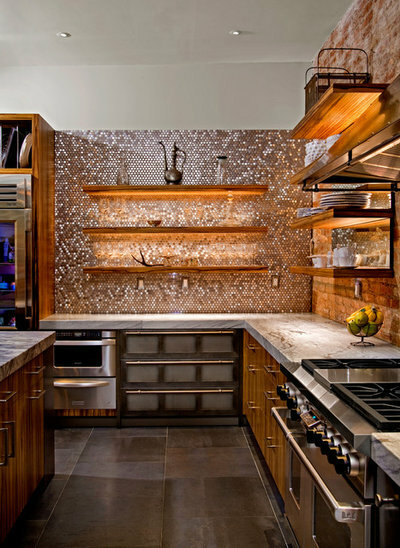 Marble tile and plank tile can be a low-care substitute for real stone and wood. Plank tile combines the beauty of hardwood with the durability of porcelain and ceramic. 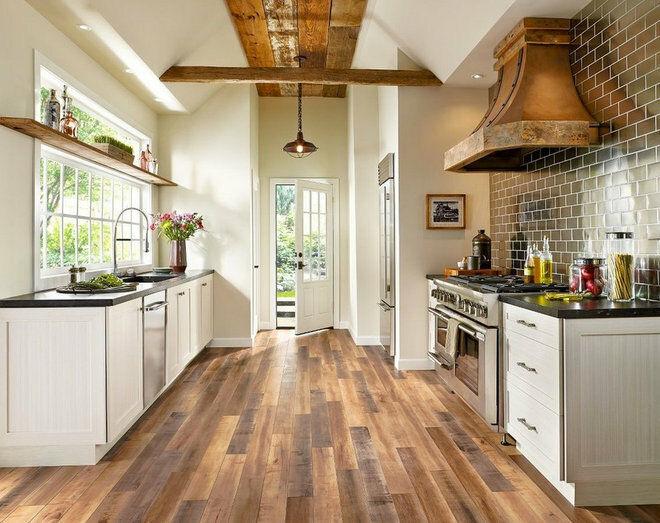 As with hardwood, you can mix and match the sizes of your planks to create depth in your kitchen. Travertine is a timeless choice and comes in many forms, including tumbled, honed and filled, chiseled, and polished. Pros: Travertine has broad appeal to home buyers. It’s highly durable — it’s a lot harder to scratch and chip natural stone than, say, tile or hardwood. Tumbled travertine offers good slip resistance because of its grooved texture. When cared for properly, it can last for ages. Cons: Travertine may not scratch, but it will stain. Be extra careful with your glass of red wine. Natural stone requires more upkeep than other types of flooring. It must be cleaned with a stone cleaner or mild detergent. You also have to seal it every one to two years to protect its porous surface (some sealers last longer). Perhaps surprisingly, a good travertine floor can cost as much as hardwood. Budget accordingly. A relatively inexpensive floor, laminate has good bang for its buck. It can spruce up your kitchen at a lower cost than hardwood while providing superior scratch resistance against foot traffic. It’s a viable alternative to hardwood floors, offering realistic wood finishes in a variety of styles. Pros: If you want to save money, laminate may be for you. Not only is it less expensive than hardwood and tile, but it also has a click-and-lock floating installation system, which is primed for DIY installation. Cons: Laminate isn’t as equipped to handle moisture as tile and vinyl are (it can warp when wet), so installing it in your kitchen can make the upkeep more challenging. If you do, use a proper moisture barrier. You’ll need a special cleaner and mop to clean it. Laminate also doesn’t have the shelf life that hardwood, tile and vinyl floors do. Vinyl flooring is manufactured in three primary forms: vinyl plank (above), vinyl tile and sheet vinyl. It has several installation methods, including peel and stick, glue down, and click and lock. It can look like wood or stone. Pros: Unlike tile, vinyl won’t chip, and unlike laminate, vinyl can handle moisture. Its durable surface won’t easily succumb to scratches and scuffs. It’s also soft on your feet, a perk for older homeowners and those with foot or knee problems. The DIY-friendly installation methods and reasonable price tag will help keep your piggy bank intact. It isn’t uncommon to find vinyl flooring under $3 per square foot. Cons: Though it varies by market, the majority of home buyers will prefer hardwood and tile to vinyl. Furniture can leave marks on vinyl’s soft surface. Foot-traffic patterns can emerge over time. High-quality vinyl planks can cost upward of $4 per square foot. Whereas vinyl plank and vinyl tile are manufactured in separate pieces, sheet vinyl is manufactured in large sheets, typically about 12 feet long. It can be more cost-effective than the other two options.